Though the HTC One X+ hasn't officially been announced yet, that hasn't stopped a healthy dose of details on the phone from spilling. Last month, a possible benchmark for the One X+ was discovered on NenaMark's website, leading many to believe HTC was about to announce a successor to their flagship One X smartphone. Now a new leak revealed the supposed hardware details of the One X's slightly beefier brother. An anonymous developer divulged the details in a rather cluttered tweet, which came complete with all the pertinent information about HTC's rumored device. As originally reported, the One X+ will apparently use a Nvidia Tegra 3 processor, though it won't be just any old 1.7GHz chip. Believed to be included with the One X+ is a new Tegra 3+ AP37 1.6GHz quad-core / 1.7GHz single-core processor. Like the original One X, this updated version will come with 1GB RAM and 32GB ROM, as well as an identical 1800mAH battery. 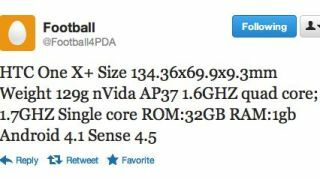 Additionally, the tweet suggests the One X+ will use Android 4.1.1: Jelly Bean, as was originally revealed in the NenaMark benchmarking. Unfortunately, the leak didn't reveal which service provider will be carrying the device. HTC will host an event on Sept.19, where we may learn more about this rumored phone, along with their "unique" tablet, or even the HTC Proto.